sciencehabit writes: If you sailed through school with high grades and perfect test scores, you probably did it with traits beyond sheer smarts. A new study of more than 6000 pairs of twins finds that academic achievement is influenced by genes affecting motivation, personality, confidence, and dozens of other traits, in addition to those that shape intelligence (abstract). The results may lead to new ways to improve childhood education. bestweasel writes: The Guardian has an interview with Keith Bristow, the head of the National Crime Agency, (sometimes called Britain's FBI, apparently) in which he says, "Britons must accept a greater loss of digital freedoms in return for greater safety from serious criminals and terrorists." He also mentions pedophiles, of course. The article seems to cover just the highlights of the interview, but in another quote he says that for "policing by consent," the consent is "expressed through legislation." While this might sound reassuring, it's coupled with the Home Secretary's call last week for greater mass surveillance powers. Presumably whoever wins power in the elections next year will claim that this gives them the required consent (that's democracy, folks!) and pass the laws. damn_registrars writes: A consortium of scientists from many different countries reviewed genome-wide association study data sets of over 250,000 individuals in a search for genetic factors that influence adult height. Looking at Single Nucleotide Polymorphisms, the researchers found 697 distinct genetic markers that can explain some 20 percent of the heritability of human adult height. Previous studies had found around 180 such markers, but the larger sample set increased the ability to detect these changes, both within genes and in non-coding regions. Genes found in this set included ones from pathways not previously connected to skeletal growth. This study is also significant for the sample size, which allows it to address whether the data from such large sets has a tendency to converge or diverge on genetic pathways; this study particularly favors the latter, which is of great utility toward studying other polygenetic conditions in the future. The original paper is likely paywalled, however the abstract is available for free and some of the collaborators behind it have other bits available for free in the meantime. 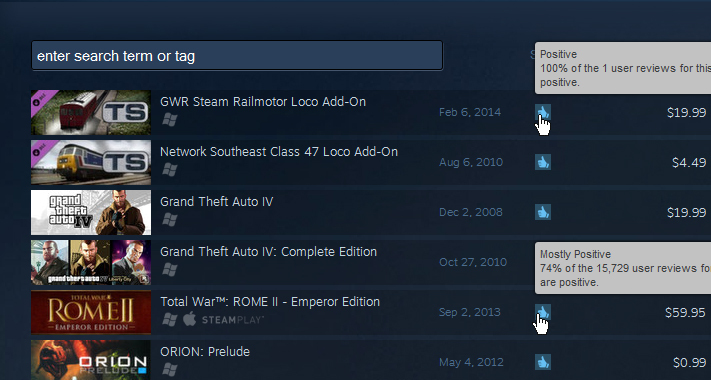 lars_doucet writes: Steam's new search page lets you sort by "user rating," but the algorithm they're using is broken. For instance, a DLC pack with a single positive review appears above a major game with a 74% score and 15,000+ ratings. The current "user rating" ranking system seems to divide everything into big semantic buckets ("Overwhelmingly Positive", "Positive", "Mixed", etc. ), stack those in order, then sort each bucket's contents by the total number of reviews per game. Given that Steam reviews skew massively positive, (about half are "very positive" or higher), this is virtually indistinguishable from a standard "most popular" chart. Luckily, there's a known solution to this problem — use statistical sampling to account for disparate numbers of user reviews, which gives "hidden gems" with statistically significant high positive ratings, but less popularity, a fighting chance against games that are already dominating the charts. cartechboy writes It's 2014. Where the heck are our flying cars? We were promised flying cars. We should be living like The Jetsons, right? Well, we aren't, but we are about to take one step closer: a production-ready flying car is debuting this month. Slovakia's Aeromobil has planning to unveil its "Flying Roadster" at the Pioneers Festival in Vianna, Austria on October 29. The latest iteration is called the Aeromobil 3.0, and work on it dates back to 1990. The Aeromobil 2.5 prototype made its first flight about a year ago. The Aeromobil transforms from plane to car by folding its wings behind the cockpit. Supposedly, the Aerobmoil will fit in a standard parking spot and run on pump gas. In less than a month, our dreams could become a reality." Matthew Green tackled iOS encryption, concluding that the change really boils down to applying the existing iOS encryption methods to more data. He also reviews the iOS approach, which uses Apple's "Secure Enclave" chip as the basis for the encryption and guesses at how it is that Apple can say it's unable to decrypt the devices. He concludes, with some clarification from a commenter, that Apple really can't (unless you use a weak password which can be brute-forced, and even then it's hard). Nikolay Elenkov looks into the preview release of Android "L." He finds that not only has Google turned encryption on by default, but appears to have incorporated hardware-based security as well, to make it impossible (or at least much more difficult) to perform brute force password searches off-device. dcblogs writes: "Gartner predicts one in three jobs will be converted to software, robots and smart machines by 2025," said Peter Sondergaard, Gartner's research director at its big Orlando conference. "New digital businesses require less labor; machines will make sense of data faster than humans can," he said. Smart machines are an emerging "super class" of technologies that perform a wide variety of work, both the physical and the intellectual kind. Machines, for instance, have been grading multiple choice test for years, but now they are grading essays and unstructured text. This cognitive capability in software will extend to other areas, including financial analysis, medical diagnostics and data analytic jobs of all sorts, says Gartner. "Knowledge work will be automated." jfruh writes People concerned about the growing gap between the rich and poor point to a common practice in Silicon Valley: going through staffing agencies for non-core jobs like janitorial and security work, leaving those workers disconnected from the company and lacking in the job security and benefits their co-workers take for granted. Google has now decided to buck the trend, bringing their security guards in-house. Former Department of Defense Chief Expects "30 Year War"
HughPickens.com writes Susan Page writes at USA Today that Leon Panetta, former head of the CIA and Secretary of the Department of Defense, says Americans should be braced for a long battle against the brutal terrorist group Islamic State that will test U.S. resolve. "I think we're looking at kind of a 30-year war," says Panetta, one that will have to extend beyond Islamic State to include emerging threats in Nigeria, Somalia, Yemen, Libya and elsewhere. Panetta also says that decisions made by President Obama over the past three years have made that battle more difficult — an explosive assessment by a respected policymaker of the president he served. Not pushing the Iraqi government harder to allow a residual US force to remain when troops withdrew in 2011, a deal he says could have been negotiated with more effort "created a vacuum in terms of the ability of that country to better protect itself, and it's out of that vacuum that ISIS began to breed." It is no surprise to Panetta that the assessment in his new book "Worthy Fights: A Memoir of Leadership in War and Peace" is drawing White House ire. "Look, I've been a guy who's always been honest," Panetta says. "I've been honest in politics, honest with the people that I deal with. I've been a straight talker. Some people like it; some people don't like it. But I wasn't going to write a book that kind of didn't express what I thought was the case."